Bank of America Merrill Lynch believes the dollar rally isn't broken, it's just pausing for a near-term correction. According to the firm's chief global technical strategist, the charts are suggesting the bullish run is far from over. "What's exciting about this decline is what it could eventually turn into," Paul Ciana said Thursday on CNBC's "Futures Now." The U.S. dollar index this week hit its lowest level since mid-May. Taking into account seasonal factors, Ciana doesn't find the dip too surprising. "Seasonality has been important this year. April is a weak month for the dollar. May is a strong month. That's exactly what played out. June happens to be another weak month," Ciana said. 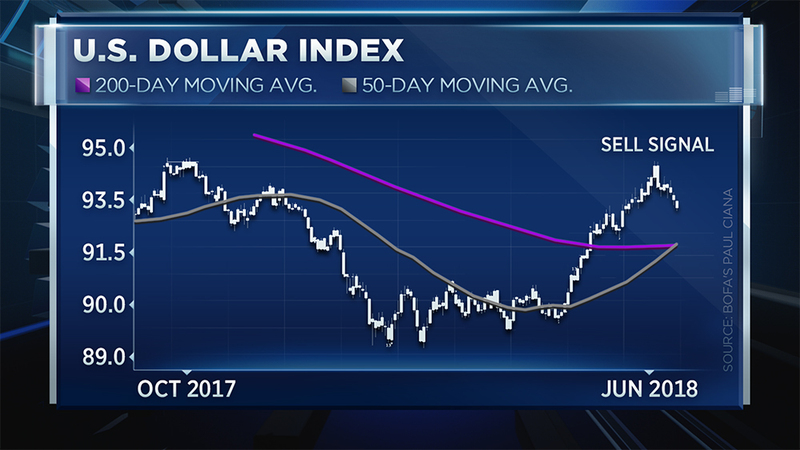 "What we think is happening right now is the dollar index is positioned to retrace about a third to maybe half of the uptrend that we've seen from the April lows there. 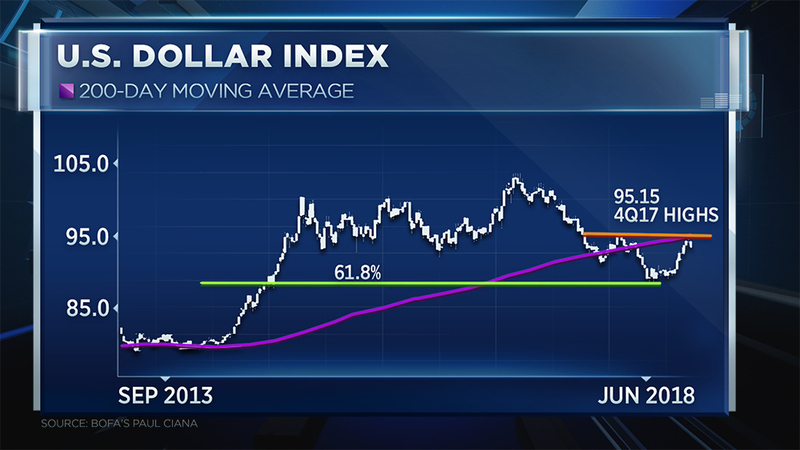 If that occurs, we would see the dollar index come right into the 200-day moving average." Based on his dollar index chart, Ciana predicted a greenback drop to 92 could spark a rally revival. "Buy the dollar dip in June because the bullish cross begins to kick in about 35 trading days later," he added. "We have a huge head and shoulders base that suggest the dollar could rally to 100." It's a scenario he sees happening this year. "I think that would be a second half 2018 story," Ciana said.